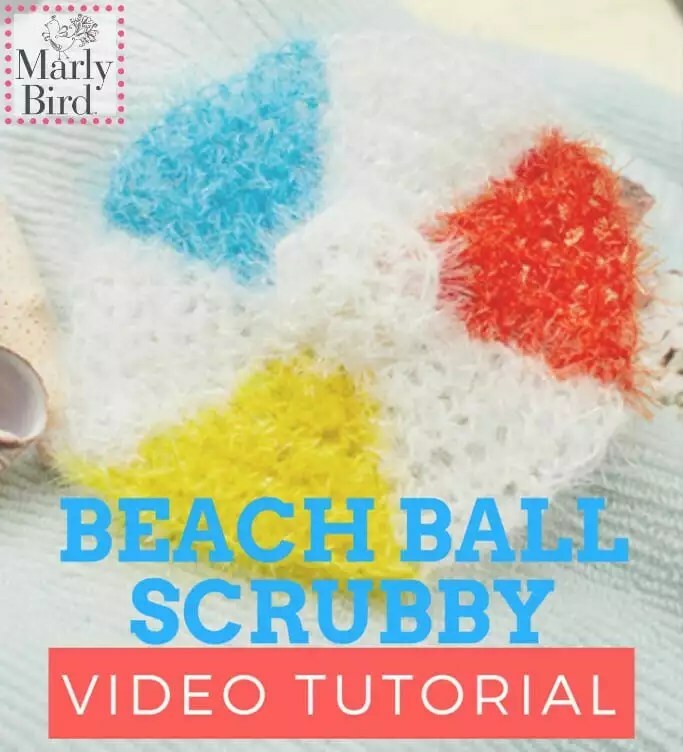 This video will show you how to crochet the Beach Ball Scrubby. Red Heart Yarn is generous enough to offer the Beach Ball Scrubby pattern for free. You can download the pattern from their website. This beach ball crochet pattern is a crowd favorite for summer days. Marly teaches you everything you need to know to make this easy and fun scrubby. Our Beach Ball Crochet Pattern Scrubby is made of six individual triangles and then sewn together. Because the Scrubby yarn has the extra pieces of yarn sticking out it can be hard to always see your stitches. Most of the work that I do with Scrubby yarn is done by feeling the stitches. I highly recommend using removable stitch markers to help you know where to start and finish a row. Download the FREE Beach Ball Scrubby pattern now and get started. Grab your materials and join me to make the Beach Ball Crochet Pattern Scrubby.